There is number of DAW-sequencer plug-ins that can work with control voltages. For example: Expert Sleepers Silent Way and M.O.T.U. Volta. Also, any specific CV source can be made with SynthEdit, SynthMaker, Pure Data, Max/MSP etc. In order to output CV to a hardware, an audio-interface with DC-coupled analog outputs is required. (Audio-interface should work correctly with direct current) Most of today’s audio-interfaces have protecting HP filters, placed right before analog outputs. These filters let only alternating current to be passed trough (outputs are AC-coupled) and also provide good dynamic range. Few old professional interfaces (MOTU 828 and others) has DC-coupled outputs. 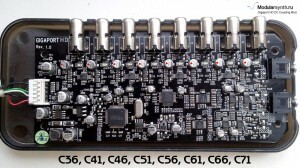 Also, Expert Sleepers has the whole range of specialized audio-interfaces and DACs with DC-coupled outputs. These are good interfaces, but a bit expensive. The ESI Gigaport HD is known as inexpensive, multichannel 24/96-ready USB audio-interface. Out of the box this interface has AC-coupled outputs but circuit can be easily modified to support CV. 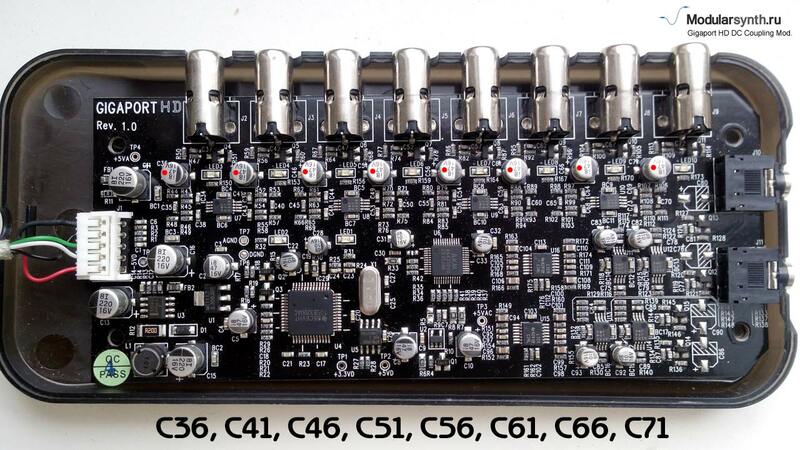 There is eight electrolytic capacitors inside the device: C36, C41, C46…C71 (marked red). All we have to do is to short capacitor’s terminals together. The first option is to solder a jumper wires around each cap. 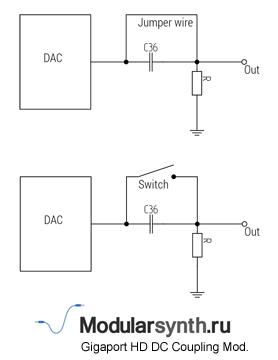 The second option is to insert switches that could toggle DC- or AC-coupling for individual outputs. Finally we got an interface that supports both CV and audio. Maximal positive sample value (32767 или 8388607) inverts (Version 3 drivers)! Use carefully! Unprotected inputs/outputs are sensitive to low-impedance current sources. Inaccurate connection may cause damage to interface or degrade it’s specs. This entry was posted in Schematics, Imporvements and tagged ESI, modifications, DIY, schematics on 15 Jun 2014 by rpocc.